Cal takes batting practice Friday at TD Ameritrade Park Omaha. This year marks the first time since 1950 that the College World Series will not be played at nearby Rosenblatt Stadium. The sparkling TD Ameritrade Park, the latest gem of downtown Omaha, hosts the College World Series this year, the first time that the event hasn’t taken place at nearby Rosenblatt Stadium. Fans watch practice and wait for an autograph from a South Carolina player. All practices were open to the public. TD Ameritrade seats around 25,000 people, but that number can be increased to 35,000 if needed. There is a large LED video screen in right field — the only screen in the park — evergreen trees behind center field, blown up pictures and banners of past champions in and outside the concourse, and a view of timeless downtown Omaha past right field. Yes, they pulled out all the stops for this one. Total costs were estimated to be $131 million — so steep that the city had to sell Rosenblatt to the local zoo to pay off debts — but it appears to be well worth it. There are the obvious perks of having a downtown stadium. Before, between, during and after games, fans can walk to and from nearby bars and restaurants. It’s central to most of the hotels, and allows for more fan interaction; a carnival-type area right in the shadows of the stadium called “Fan Fest” offers the traditional ballpark fare — hot dogs, corn dogs, funnel cakes and cheese-soaked nachos — and has contest booths where kids can test their baseball skills in batting cages and ball toss. 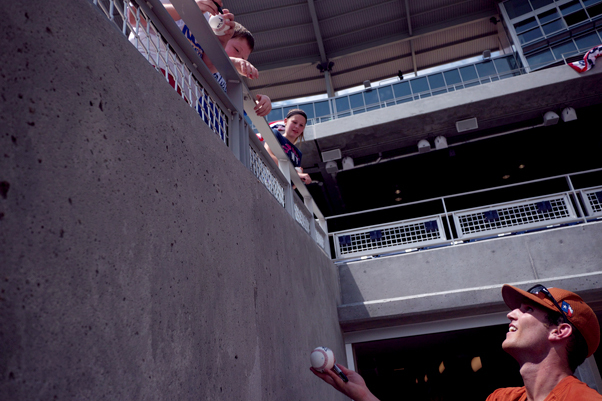 Kevin Lusson tosses an autographed ball back to a fan. 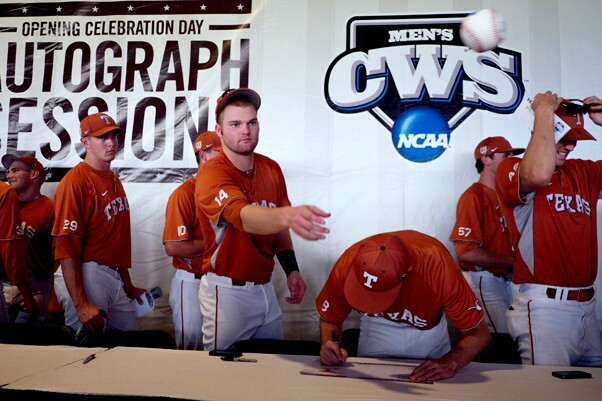 Texas signed autographs in the concourse from 1 to 2 p.m.
T-shirt shops and hat stands have sprung about in the recent days, drawing in revenue from fans looking for memorabilia to take back home with them. Jason Martinez, manager of DiGiorgio’s Sportswear, says TD Ameritrade is great for business because it keeps everybody central. DiGiorgio’s is also doing its best to help local causes, donating $5 to the American Red Cross for every purchase of a “I Survived the Missouri River Flood, 2011,” shirt. “Even a week before the World Series even started, we’ve had a lot more business than we usually do,” said Tim Goodnight, manager of ‘goodnights,’ a North Downtown Omaha pizza bar. According to Goodnight, the fact that TD Ameritrade is downtown means hoards of customers. The park is so nice, so good for business that it’s almost easy to forget they’ll be playing baseball here. Just one day before the start of the event, grounds crews were doing their best to maintain the quality of the place. Infield dirt was raked and watered about every 20 minutes, tarps were laid over much of the infield and behind home plate to preserve the grass, the field was being mowed, and fresh coats of paint were being applied to each baseline. The field looks exactly the same at 5 p.m. as it did at 11 a.m., six hours and eight team practices later. 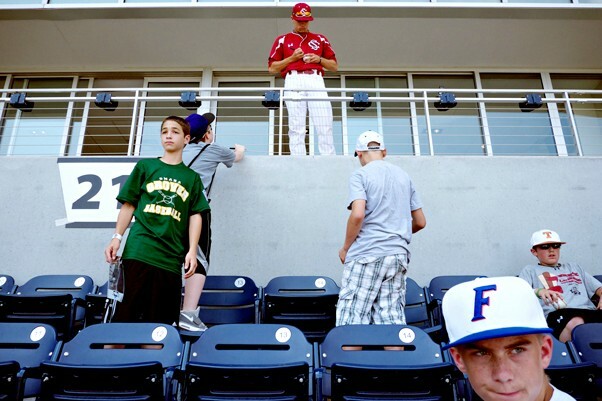 Bullpen catcher Patrick Marsh interacts with fans Friday. Some writers have harped that they miss Rosenblatt — the nostalgia of the old “Diamond on the Hill,” and its theme park-like façade of blue, red and yellow, and the community feel that the suburban ballpark provided. But that is one of the only advantages Rosenblatt has on Ameritrade. Vanderbilt head coach Tim Corbin noted that it was a state-of-the-art facility, Texas coach Augie Garrido called it a “great endorsement for the future of college baseball,” and Florida coach Kevin O’Sullivan said it kept his players up Thursday night. “The guys were talking this morning about how they could sit in the hotel last night and look out the window at the stadium lights, and how beautiful it all was,” he said.